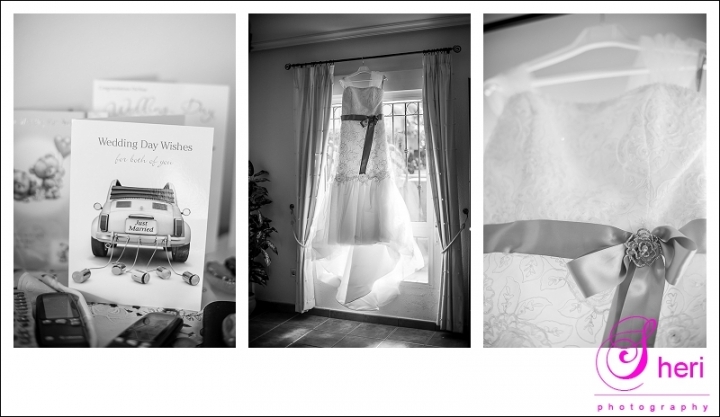 Emily got ready with her bridesmaids, mum and dad in their house in Cabo Roig. Dad was ever so emotional when he saw his little girl for the first time in her beautiful weddingdress. Mind you he wasn’t the only one 😉 I think everyone needed the kleenex- bridesmaid to pass them a tissue and she took her job ever so serious haha. Emily is a basketball girl so when we took a group photo in the house they couldn’t resist doing their yell. The ceremony took place in the church of Pilar de la Horadada and was followed by a lovely reception at the Orihuela Costa Resort. The bride and groom photos were taken at the hotel and gosh haven’t met a groom before that loved posing so much as Alan even with the flowers, which were beautifully done by Tagua in Campoamor! Alan was brilliant and Emily a natural beauty. Emily and Alan had a big surprise for everyone….they didn’t have an actual seating plan but instead they had embarassing photos of everybody next to their plates. Most were taken of people in a drunken state as you can imagine. The faces of the guests when they entered the dining area….priceless! The food was absolutely delicious and the speeches sooo funny. Have a look below to see some of their shots, hope you like them.